There's no question that Intel has thus far largely missed the mobile bandwagon. But that doesn't mean Intel stock isn't a bargain at today's price. There are few technology analysts who would excuse Intel's (NASDAQ:INTC) failure to both foresee and participate in the mobile computing revolution. But does this egregious oversight, capped off by the CEO's pending retirement, mean that Intel stock is a lost cause? Hardly. In my opinion, in fact, it's one of the biggest blue chip bargains today. 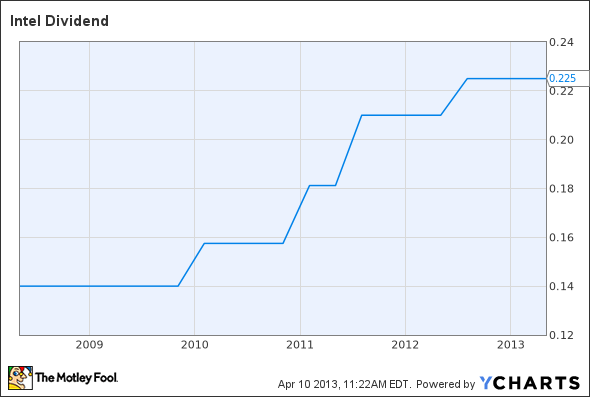 Take Intel's dividend yield. At 4.3%, it blows other blue chip stocks out of the water. According to The Wall Street Journal, the average yield on the S&P 500 is 2.12%. And the same figure for the Dow Jones Industrial Average is 2.43%. To sweeten the pot, Intel consistently increases its quarterly distribution. Five years ago, as you can see in the chart above, Intel stock paid out $0.14 per share each quarter. This year it's paying $0.225. That equates to a 60% increase. The chip giant's price-to-earnings ratio similarly supports the notion that its stock is inexpensive on a relative basis. Trading for 10.5 times earnings, it's valued at nearly half the average company on the S&P 500, which comes in at 18.4 times earnings. INTC Total Return Price data by YCharts. What explains the disparity here? 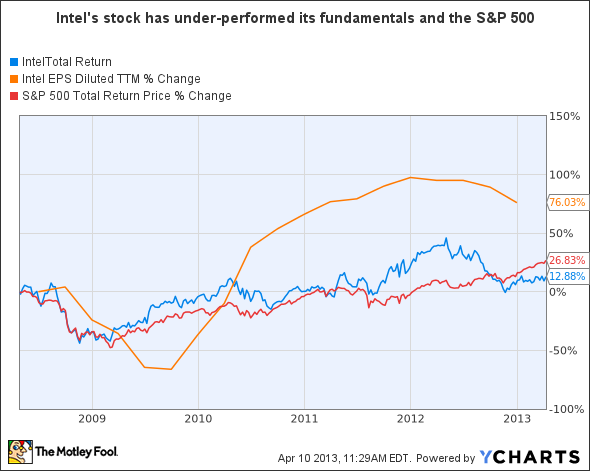 Quite simply, Intel's fundamentals have far outperformed its share price over the last five years. While its earnings per share have increased by 76%, its total return has gone up by a mere 13%. For the record, that's half the total return on the S&P 500. So what does this mean? In my humble opinion -- and I am an Intel shareholder -- if blue chips are your thing, then you could do a lot worse than Intel stock at today's price.